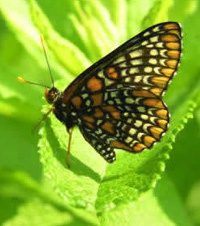 Overall butterfly numbers were lower than average on both butterfly counts in 2009. The Oshawa count tallied only 27 species, the poorest in the 17 years of the count. This was due to cool temperatures (14º to 19º C.), complete lack of sun and periods of rain on the day of the count. Butterflies need sun to be active. Without sun, it is not possible to get a true picture of butterfly numbers, and therefore the results of the Oshawa count were not reflective of the current population. One team only encountered 5 individuals of 4 species. Strangely enough, European Skippers were still found in relatively large numbers in some areas. Only 301 native butterflies (i.e. other than Cabbage White and European Skipper) were counted, whereas the average over the previous 16 years was about 2600. It was a count we would rather forget, and hope for a better day next year. The Sunderland count fared much better with 52 species recorded, but numbers of most species were lower than average. Overall June and July were cooler and wetter than average and had less sunshine than average. Consequently most butterflies emerged later than most years and never built up the populations. Butterfly numbers were only about half of 2008. Three species recorded almost every year on both counts: Black Swallowtail, Red Admiral and Red-spotted Purple, were not recorded on either this year. Hairstreaks were also very low. The big highlight of the Sunderland count was the discovery of two Mulberry Wing Skippers by Dennis Barry near Brown Hill. This is a provincially rare sedge feeding skipper that has only recently been discovered in Durham Region. A few other highlights were Harvester, Milbert‘s Tortoiseshell and Little Glassywing. A record number of Meadow Fritillaries were counted and nearly all of these were observed in a single field. Sadly, three fields that were very productive for butterflies in past years were found to be plowed up and tile drained this year. The two Durham butterfly counts were well attended. A total of 45 species were recorded at Oshawa, which is about average, while Sunderland had more at 56 species. Several members of Pickering Naturalists participated in the two counts. Gray Comma was a new species for Oshawa even though it is regularly recorded at Sunderland. There were no new species recorded but Harris’ Checkerspot and Two-spotted Skipper had only once been previously encountered at Oshawa (out of 16 years) and it was second Compton’s Tortoiseshell for Sunderland (out of 12 years). The late spring had delayed the emergence of some later species, consequently sedge skippers (e.g. Broad-winged and Dion Skippers) were in low numbers at Sunderland. Numbers or Red Admirals and ladies were also very low. 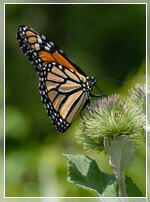 There were good counts of Monarch Butterflies on both counts, but not as high as in 2007. Overall Monarch numbers by late summer were not in the same numbers as in the previous two years. Oshawa had a record high count of Eyed Browns, with 90% in one meadow marsh. Sunderland recorded a record number of Meadow Fritillaries with more than half of the total number from one field. Cabbage Whites were especially numerous in the Sunderland circle. Outside of the butterfly counts, the big butterfly news story for Durham this year was the record numbers of Giant Swallowtails appearing mostly near Lake Ontario in the late summer with individuals being reported at Cranberry Marsh, Darlington Park, Whitby and Pickering. This is a southern butterfly that normally does not occur north of the Carolinian Zone. The Butterfly field trip to Layton River Wetland was a joint venture of the Durham Region Field Naturalists and Pickering Naturalists on Saturday, July 5, 2008 led by Rayfield Pye. Attendees saw 19 species of Butterflies. The two most common butterflies along the route were the European Skipper and the Cabbage White. Some Mustard Whites were seen. These are the unspotted cousin of the Cabbage White. Monarch butterflies were encountered where there was Milkweed. The mimic of Monarchs – the Viceroy was also present. Viceroys live in wet areas, are one third less in size than a Monarch and have a black line running across the hindwing. We also had a great closeup of a Baltimore Checkerspot. These dark coloured butterflies live as larvae on the White Turtlehead plant. The smallest butterflies on the trail were the Summer Azure and the Coral Hairstreak. Both butterflies are blue on top and light blue below. They differ in the amount of spotting and patterning on the hindwing. Common on many of the plants were Pearl and Northern Crescents. Both Crescents have an orange background colour but differ in the amount of black present on the hindwing. Flitting about the foliage on either side of the trail were Common Ringlets, Eyed Browns, Orange Sulphurs, White and Red Admirals. Butterflies that flit about quickly and randomly are called Anglewings. Two Anglewings, the Eastern Comma and the Gray Comma were seen. The Comma name is derived from the comma-shaped mark on the hindwing. The last butterfly we saw was the Bronzed Copper, a bog butterfly. Coppers get their name from the coppery colour on their underwing. 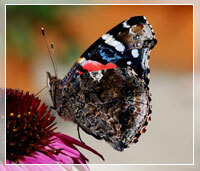 Travelling a trail through a wetland is an excellent way to see a number of different Butterfly species. Next time you’re in butterfly habitat, perhaps reader you will regard these creatures more closely.